A video in French, that is the not so usual treat I have for you in this week’s blog post. 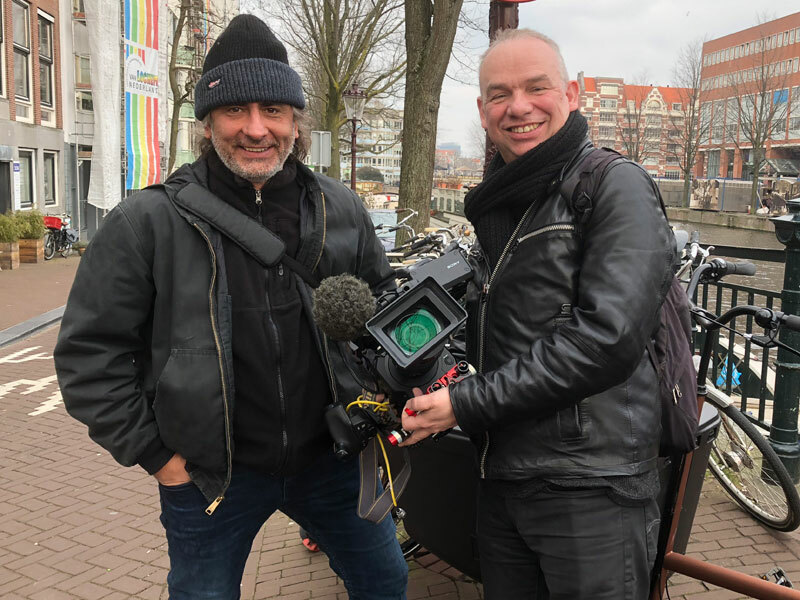 In March 2018, a professional film team was working in Amsterdam. 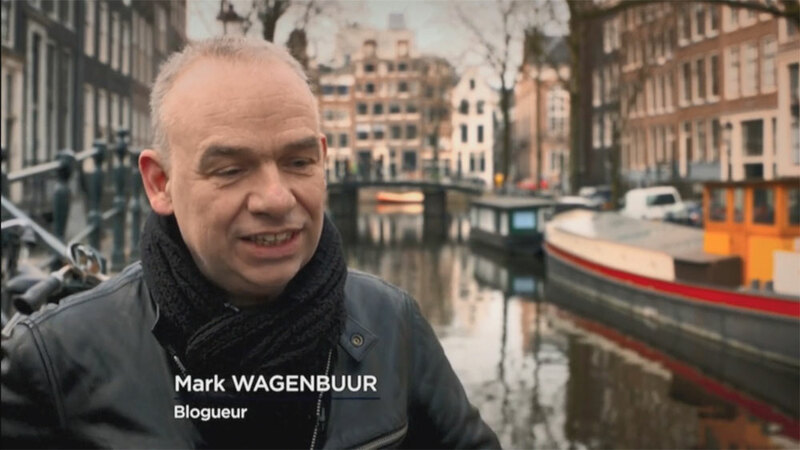 They were creating a documentary for French TV and they interviewed me about cycling in the Netherlands (and especially Amsterdam). The item would appear in a travel documentary for the station “Voyage” (supported by TV5 Monde). The filmmaker kindly gave me permission to show you part of the end-result. Early March 2018 it was still very much winter. The team was even able to film the Dutch skating on the canals of Amsterdam. You know: because that’s how we go to work in winter. 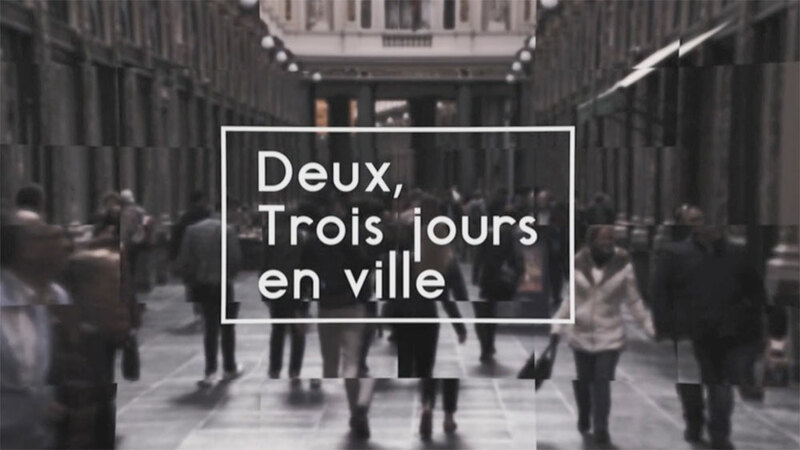 The documentary about Amsterdam is an episode in the series called “Deux, Trois jours en ville” (Two, Three days in the city”). It was really nice to meet ‘réalisatrice’ Nadine Kuhn and the camera man Robert Isemi. They came well prepared and had arranged a rental bicycle for me. I had never ridden on such an obvious tourist bike. The Amsterdammers consider anyone on such a bicycle a clumsy tourist, which was quite funny because the way I rode it clearly revealed that I am not. 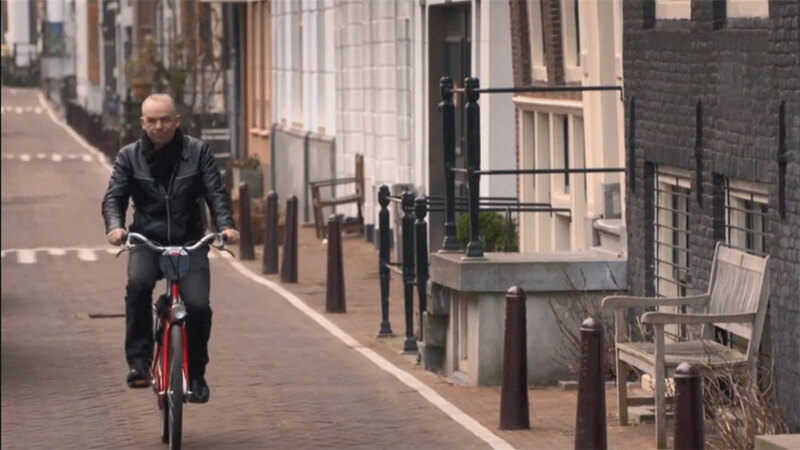 The entire program is almost one hour-long and besides this item about cycling there were also visits to museums, house boats, a jeans workshop, a flower bulb producer and places to eat. The program was broadcast in the period from November 2018 to earlier this month of January 2019. Nadine was very kind when she gave me permission to download the item including my interview and to reuse the images as I please. I decided to subtitle the item in English so you can follow it too. I do understand a lot of French but my French is not so good that I could do the interview in French. Also for the subtitles, I asked a friend in France to help me with a few sentences I didn’t quite get. But the translation should be okay now. It may not be an entirely literal translation but the general story is certainly right. It was interesting that Nadine had a detailed script that we followed. This means the topics are hers. It’s obvious that she wanted to paint a positive image of cycling highlighting the benefits of cycling to a society. 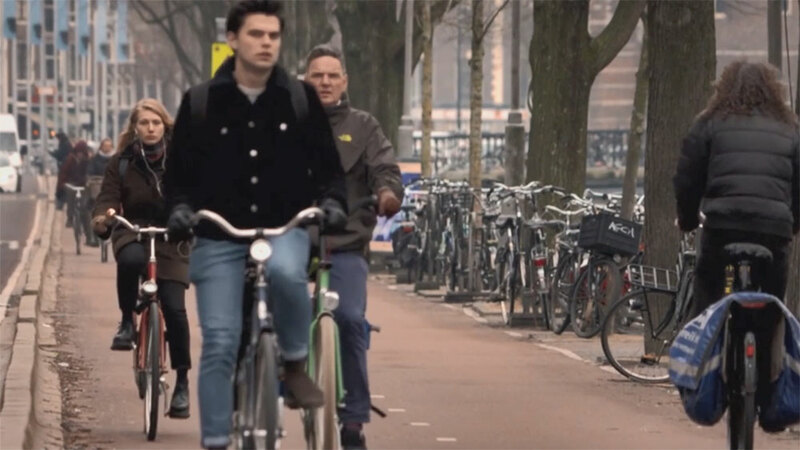 And the history section leaned on my older post about how the Dutch got their cyclepaths. But I don’t usually speak about the taxation of bicycles. The Netherlands did have a general bicycle tax from 1924 to 1941. People had to buy a tag every year for every bicycle for 3 guilders (later ƒ2.50). There was a scheme for the unemployed who could get a tag for free. These were clearly punched and could only be used on working days, creating a stigma. The bicycle tax was very disliked by the public. I say in the video that it was abolished because the cost was more than the revenue. That is not entirely true. This is the currently valid reason for not reintroducing it. The taxation in that time did give the Dutch treasury millions of Guilders. It were the German authorities who abolished it during the occupation of the Netherlands in WWII. The tax was never reintroduced after the war. It is bitter to note that another German rule to do with cycling also remained unchanged after the war. The rule that cyclists coming from the right did no longer have priority over cars. That law stayed in place for 60 years, until May 2001! Now all traffic from the right (when there is no other priority arrangement on an intersection) has the right of way again. The most well-known Nazi action regarding cycling was the fact that the Germans confiscated every Dutch bicycle they could find to take them to Germany, where they reused the steel for the war industry. In the decades after the war generations of Dutch annoyed German tourists asking for directions by saying “First I want my (grand-)(father’s) bicycle back!” for that reason. My final remark, that the bicycle plays a part in the tolerant atmosphere of Amsterdam, was also a line I was given from the script. This would tie this item to the rest of the film better. There is some truth in that, so I obliged. To film me while I was riding this camera was mounted on my handlebars. There was also one attached to the rear rack. It meant I had to do every shot twice, with and without these extra cameras. In the end only the ones with the big camera were used and nothing from these mounted cameras. It was interesting for me to see professional filmmakers at work. We filmed all morning for these 4 minutes. The scenes with the ferry involved us going across the IJ and back and I rode so much more on that bicycle, than the few scenes that were used. 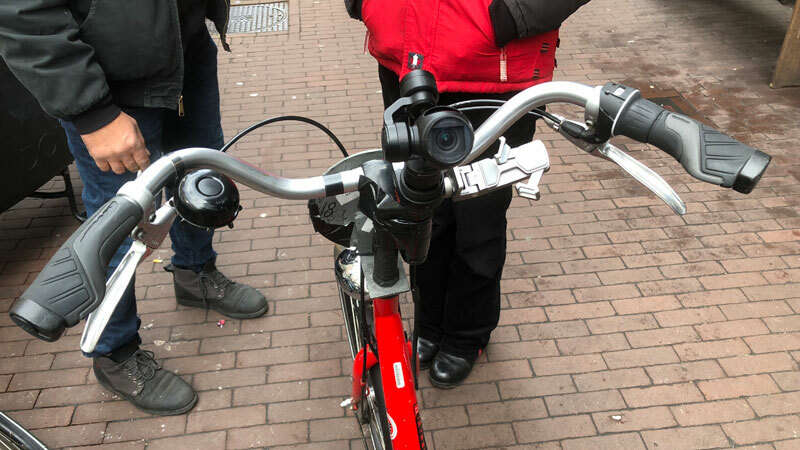 Robert had even installed small cameras on my handle bars and the back rack of my bicycle. Those images were not used, fortunately! I don’t believe that handlebar camera would capture me from my best side! I also know from experience that any camera mounted to a bicycle gets you very shaky images. Nadine and Robert then treated me to lunch and after that they went on filming with other people. 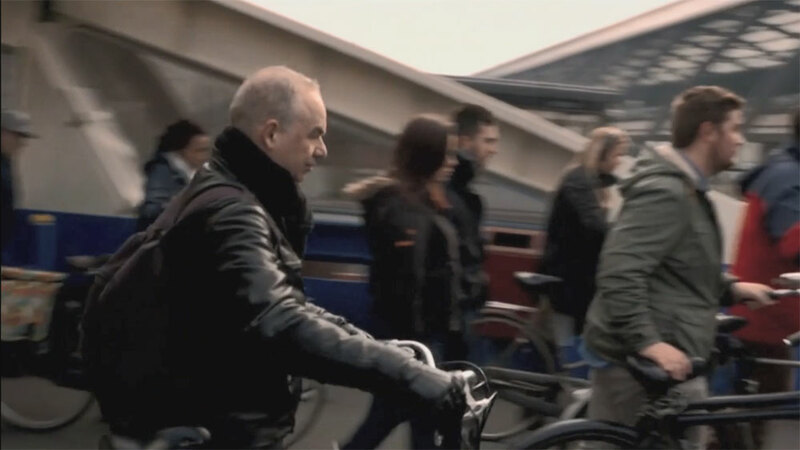 I did too: that afternoon I filmed the redesigned intersection at Mr Vissersplein, while I was in Amsterdam anyway. 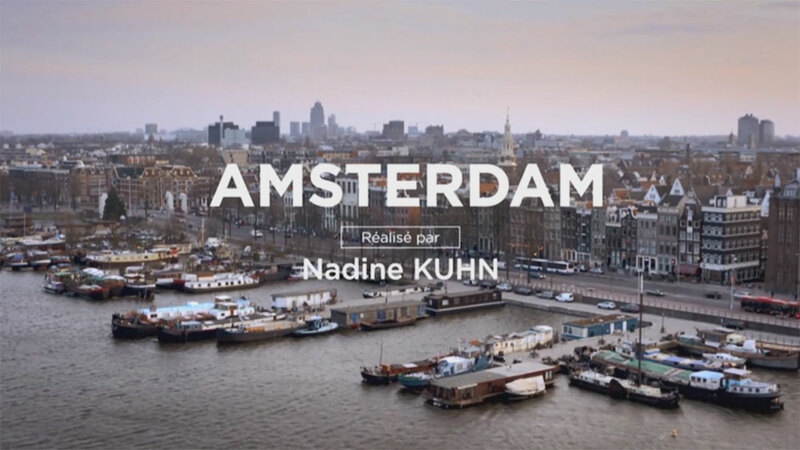 Video by Nadine Kuhn, featuring yours truly on a bicycle in Amsterdam. What an interesting description of your process of filming. Thanks for sharing this all! How do we get to see the whole show? BTW, GREAT job!! 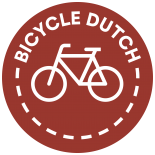 This entry was posted on 23 January 2019 by Bicycle Dutch in Original posts and tagged Amsterdam, bicycle culture, history.